Natural History museums are some of my favourite places to visit and, since I was recently in Braunschweig, I took the opportunity to visit the Naturhistorische Museum Braunschweig. Someone told me this is the oldest museum in Europe, while the museum website has the slightly more modest claim of being the oldest museum in Germany. In any case it was founded in 1754 by Carl I. of Brunswick and Luneburg, and is currently housed right next to the university. 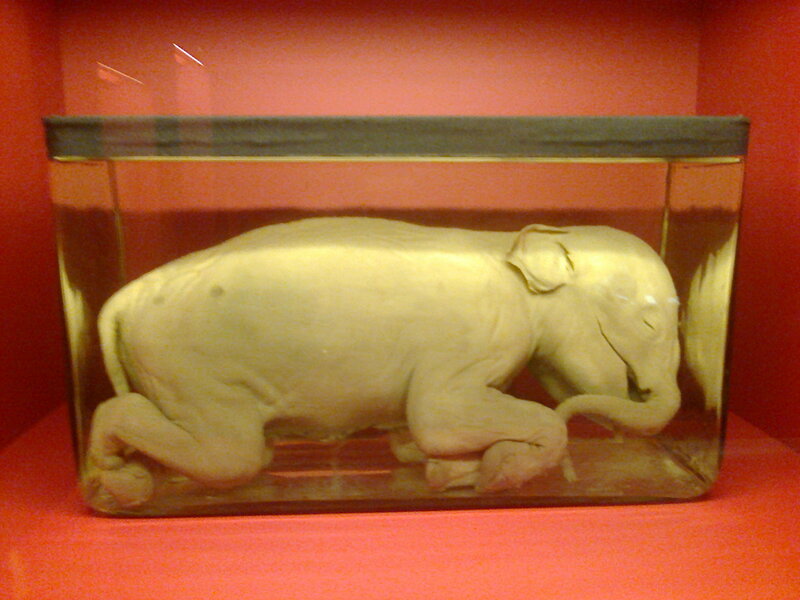 Everyone needs an elephant embryo. The museum itself is a decent size, spanning four floors (there is a lift of stairs are not your friend). All the information in the museum is in German, but I was generally able to work out what each section was. On the ground floor there is a small section dedicated to its founder, with some cool examples from his original collection. At first it seemed to be a typical, slightly old fashioned, museum, with stuffed animals arranged in little murals. Each mural contained one main species, plus one of two smaller species slightly hidden amongst the fake vegetation. There was also a nice insect section, with information on the huge number of insect species as well as some cool examples of wasp and ant nests. The museum really comes into its own on the upper floors. There was an impressive dinosaur room, with touchscreens showing information on the excavation programs, as well as ton and ton of fossils. Possibly my favour part was the microscopes they had set up so you could view microfossils and insects preserved in amber. Given that no natural history museum is complete these days without live animals, they also have an aquarium and vivarium in the basement with a good range of animals. Price? 4 euros for an adult. There is also a student discount and education groups go free. Interactive? A bit, there were some touchscreens around the place showing videos and other information. The fossil section also had the aforementioned microscopes, plus draws to pull out and some phones playing animals calls. Educational? Yes. There was a good amount of information on topics like evolution, ecology and conservation. In particular the section on insects has some nice examples of food webs and there was even a display dedicated to human evolution. Adults or kids? This museum is probably aimed more towards adults, but there certainly seemed to be enough to keep kids happy too. Shop? The shop was small but carried all the required novelty pencils, plastic dinosaurs and soft toys. Overall? It was good value for money and the staff seemed friendly despite language barrier. I would definitely recommend a visit if you are in the area.